Opening Day of the Neighborhood Markets! After torrential rain on Saturday afternoon, Sunday morning dawned clear and sunny. 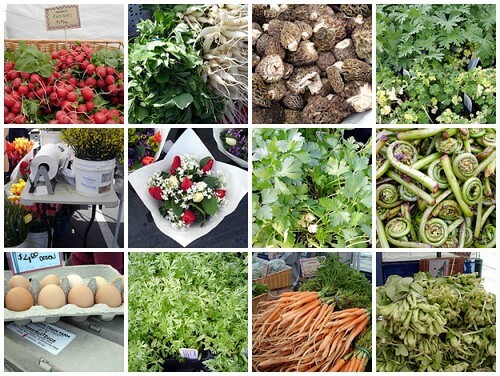 It was the perfect start to the Farmers’ Market season! It was a bit crisp when I left the house but by the time I reached West Seattle the air was warming slightly and, when in the sun, it was very pleasant. I was pleased to see the crowds at the market – I love that the communities really support these independent producers. I took my normal stroll around the market to see what was being offered, another loop around to make my purchases and a final stop to pick up a little treat for later in the day. I left the market with a bag full of treasure including pea vines, spring onions and other vegetables; beautiful brown eggs; fresh spring goat cheese and Chevre; a tomato plant and a couple of herb plants; and a bargain bottle of a Moroccan style marinade. My head was dancing with all the potential! I wish I live where there are fresh fruits and vegetables, especially in the Spring. I really envy you. In my area, if I want fresh of anything, I\’d better grow it myself or be ready to pay an arm and a leg. Oh, that would be hard! Where do you live?